Waiting at Wandsworth Town. Photo by James Beard. Named after the river Wandle, the Thames' largest London tributary, the borough of Wandsworth stretches from Battersea Park to Wimbledon Common, embracing Tooting Bec and Putney Heath within its borders. It's London's ninth biggest borough, in terms of population; and the third biggest 'inner' London borough, in terms of geographical area. If you live in Wandsworth, you're in good company. Hundreds of celebrated personalities have made what is now the borough their home over the years: Thomas Cromwell; David Lloyd George; Kevin Spacey; Keira Knightley; Mark Owen; Sophie Dahl; Sadiq Khan; Frank Bruno; Grace Jones; Marc Bolan; Richard Branson; and Konnie Huq. Wandsworth's literary connections are many: William Makepeace Thackeray, Mary Wollstonecraft Shelley, Voltaire, Daniel Defoe, and Thomas Hardy have all lived in the Borough. 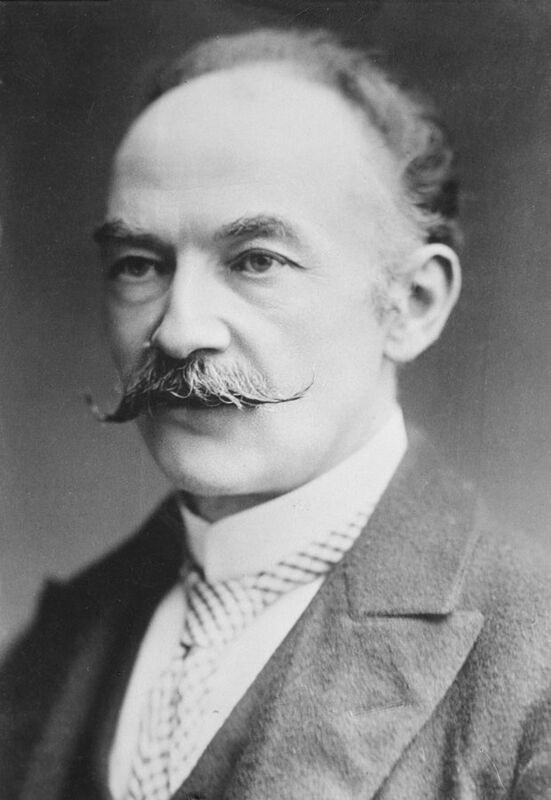 Thomas Hardy lived on the Wandsworth Road from 1878 to 1881, before he had established himself as a writer. George Elliot wrote Mill on the Floss while living on Wimbledon Park Road; and Louis de Bernières lived in Earlsfield while he was writing Captain Corelli's Mandolin. 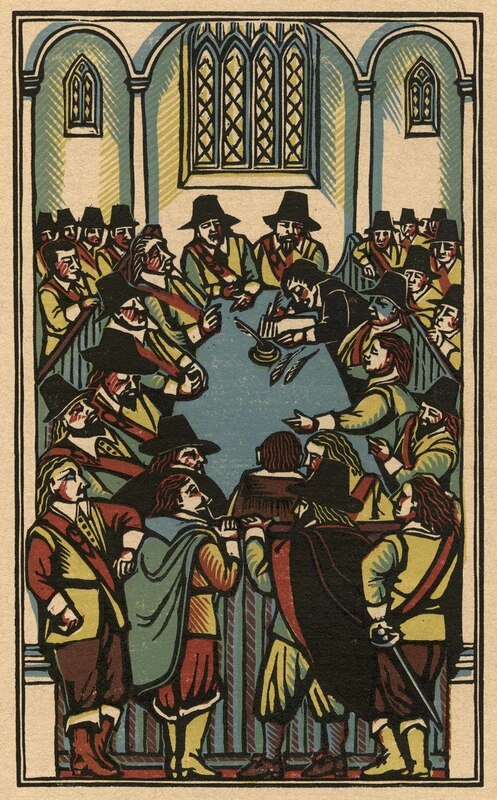 The Putney Debates of 1647 put forward some of the key democratic rights enjoyed by citizens across the world today. During the Civil War, with the Roundheads looking like they were gaining the upper hand, some members of the New Model Army were worried the king would be replaced by yet another autocratic ruler. At a meeting in Putney's St Mary The Virgin Church, they put forward some pretty radical ideas: one man, one vote; power to lie with a democratically elected parliament, rather than with the monarch; freedom of conscience, freedom from conscription into the armed forces; and equality before the law. 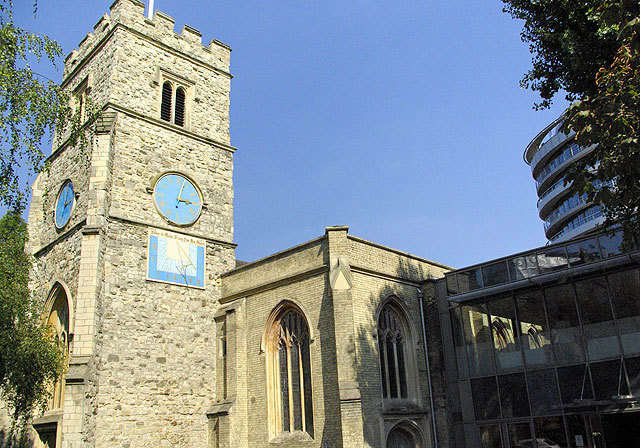 St Mary The Virgin Church in Putney. It's safe to say these big ideas caught on: the Putney Debates actually inspired much of the language of the US Declaration of Independence. 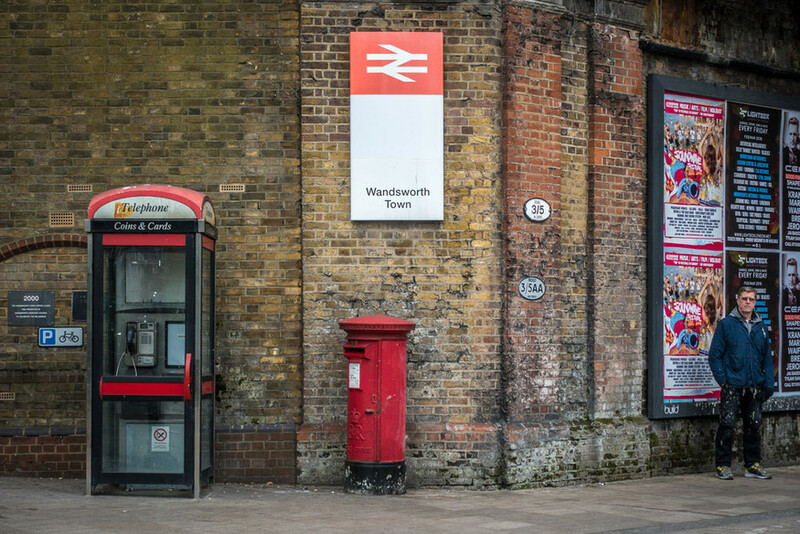 Wandsworth is home to England's — and possibly the world's — oldest public railway, the Surrey Iron Railway. 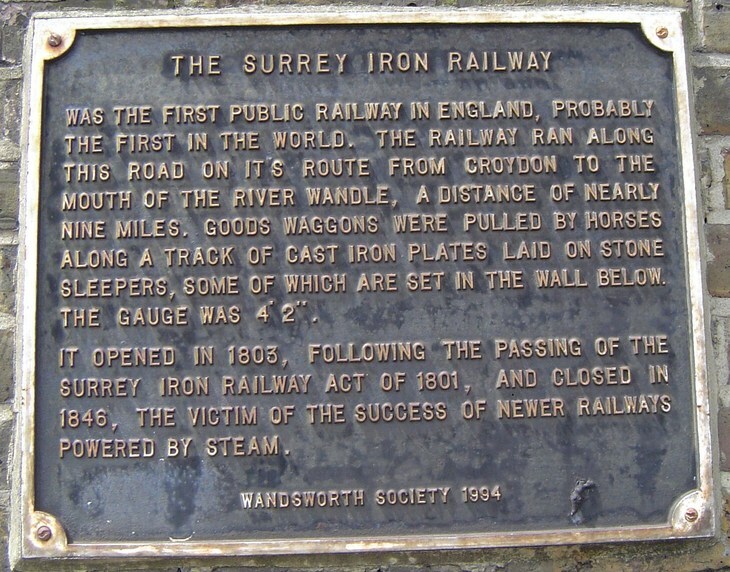 Running from Wandsworth to Merstham in Surrey, via Croydon — a distance of nearly nine miles — the Surrey Iron Railway opened in 1803. 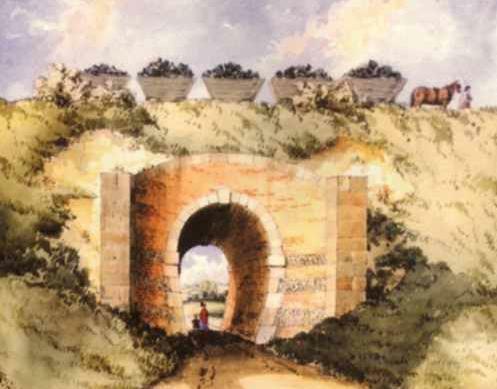 A watercolour of the Surrey Iron Railway. Painter unknown. But it wasn't quite a railway as we might think of it today, and it certainly didn't carry passengers. It was a horse-drawn railway, paid for by tolls, usually for transporting coal, building materials, lime, manure, corn and seed. Plaque for the Surrey Iron Railway in Wandsworth that was set in the wall of Young's Brewery until the wall's demolition in December 2014. Used under creative commons licence. It was a commercial success only for a short time, defeated by the London to Croydon canal, and the advent of faster steam trains. The track, or cast-iron plateway, couldn't support the weight of a locomotive, and the railway closed on 31 August 1846. 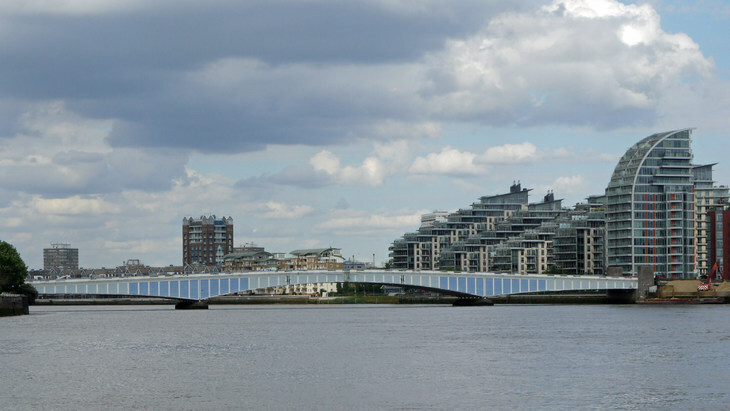 As a Thames-side borough, Wandsworth has plenty to offer London's pontists, with no fewer than eight bridges crossing the river within its boundaries. There's Grosvenor bridge; Chelsea bridge; Albert bridge; Battersea and Battersea Railway bridges; Wandsworth bridge; Fulham railway bridge; and Putney Bridge. It can also lay claim to what might be the Thames' most boring bridge: Wandsworth bridge is an unadorned steel cantilever bridge. Boring old Wandsworth Bridge. Photo by David Bridges. When it was opened in 1940, it was painted dull blue as camouflage against air raids: the rather insipid colour scheme remains today. Although it's one of London's busiest bridges (carrying more than 50,000 vehicles daily is not to be sniffed at), it's been described as "probably the least interesting bridge in London". 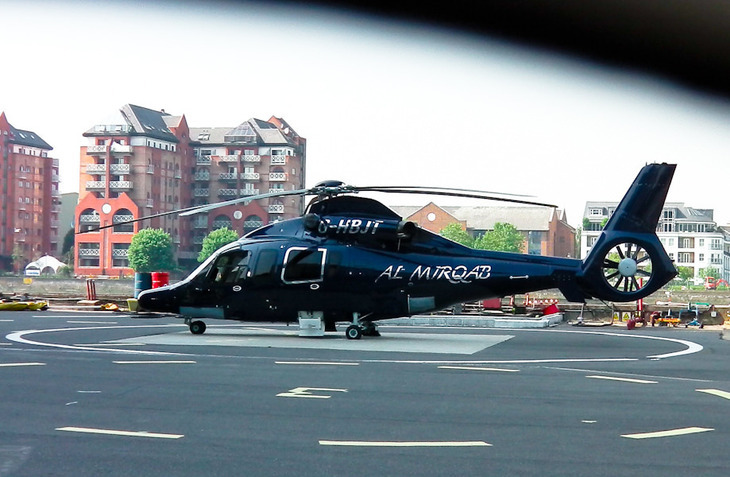 We lesser mortals, who tend to travel by tube and bus, might not know that Wandsworth is home to London's only licensed heliport. The London Heliport. Photo by Liane Kay. It's really small, using of a jetty to provide a helipad for take-off and landing, and with onshore 'parking' for just three to four aircraft, depending on their size. It opened in 1959, and for a while was owned by Harrods. Seriously. There's a 28km-diameter crater on Mars named after Tooting, thanks to Wandsworth resident and planetary expert, Pete Mouginis-Mark. 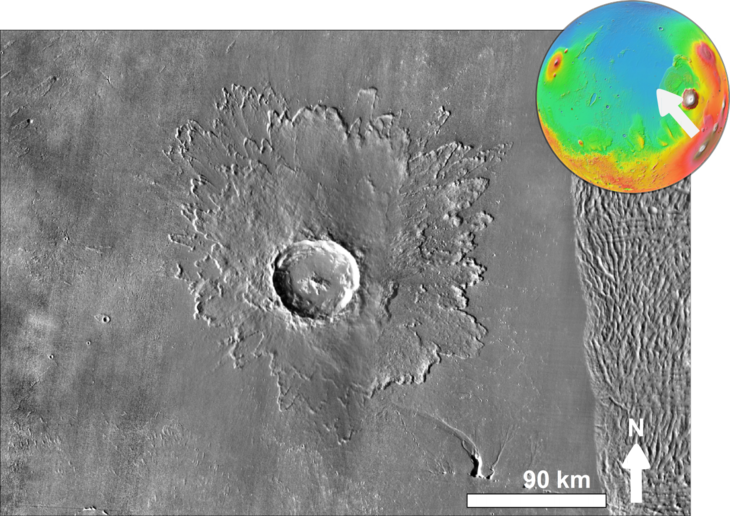 According to the International Astronomical Union's rules for planetary nomenclature, craters on Mars less than 60km in diameter should be named after "villages of the world with a population of less than 100,000". Impact crater Tooting on Mars. Photo used under wikicommons licence. Pete Mouginis-Mark discovered the crater close to one of the Red Planet's small river valleys, which, he said, reminded him of Tooting Bec. "I thought my mum and brother would get a kick out of having their home town paired with a land form on Mars," Mouginis-Mark said. Well done, that chap. While London is lucky to have many Michelin-starred restaurants, only a handful are located south of the river. One of just four south London establishments to hold stars at the last count is Wandsworth Common's Chez Bruce. Chez Bruce from the outside. 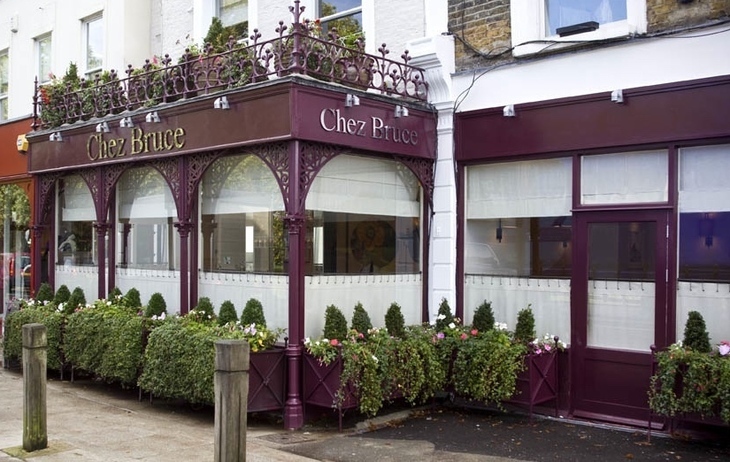 In 2006, Chez Bruce was first named as 'Londoners' Favourite Restaurant' in a Harden's London Restaurant survey: they went on to hold the title for four consecutive years. At the time of writing it's £55 for three courses, which seems pretty decent value for us. Trying to negotiate Wandsworth's unforgiving Trinity Road on foot can sometimes feel like you're stuck in a parallel south London dystopia. Bleak. Photo by Steve A. 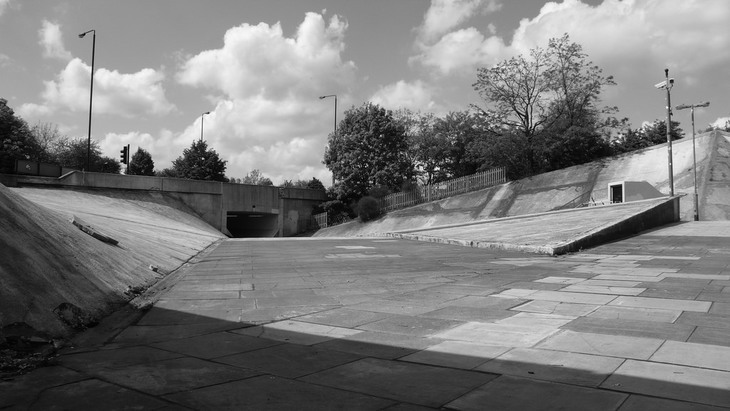 If you use one of the four, bleak, unloved underpasses beneath the Wandsworth Bridge roundabout, and feel an involuntary shiver, it might be because something in your subconscious remembers this is where Alex and his Droogs attack a tramp in Stanley Kubrick's A Clockwork Orange. Stanley Kubrick with Malcolm McDowell on set below the York Road roundabout, 1971. (Stanley Kubrick Archive). We're not sure which of the uninspiring quartet of underground spaces was actually used: movie-locations.com thinks it was the southern one, between Trinity Road and Swandon Way. Built in 1851 as Surrey House of Correction, what is now called Wandsworth Prison is the largest prison in London and one of the largest in Europe. Notable inmates include Charles Bronson, Ronnie Kray, Julian Assange, Pete Doherty and Gary Glitter. Panoramic photograph of Wandsworth Prison. Photo used under Creative Commons licence. Oscar Wilde served the first six months of his sentence here in 1895, before being moved to Reading. Great Train robber Ronnie Biggs escaped from Wandsworth Prison in 1965, after serving just 15 months of his 30-year sentence. In 1926, Southfields in Wandsworth became home to London's first purpose-built mosque. The Fazl-Mosque, or London Mosque was inaugurated on 23 October 1926. The construction of the mosque was financed by donations from the Ahmadi Muslim women in Qadian, India. 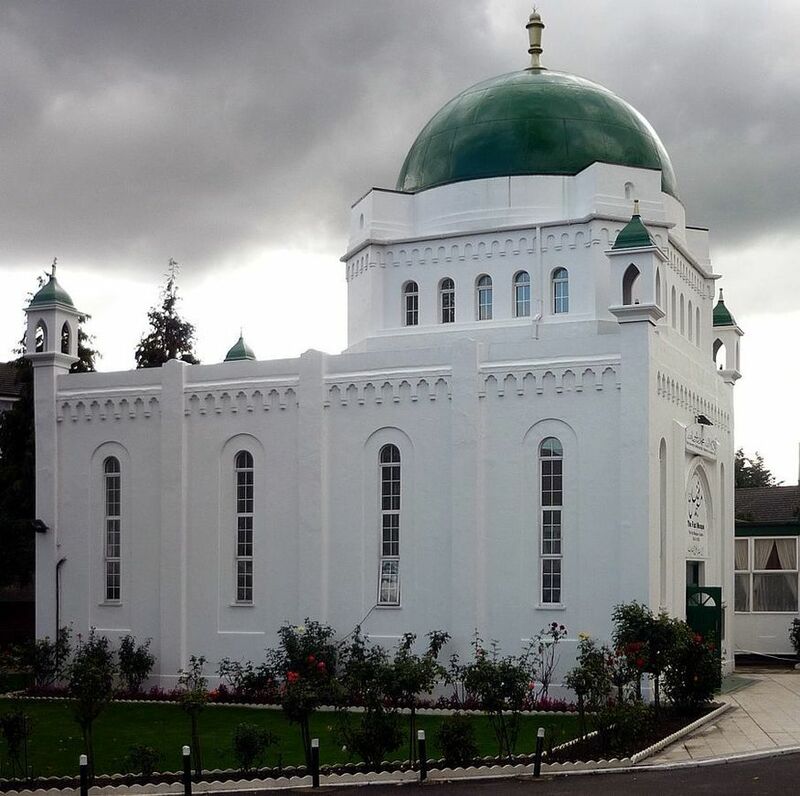 The Fazl-Mosque in London, also called "The London Mosque", was the first purpose-built mosque in London. Photo used under creative commons licence. Since 1984, the mosque has been the international headquarters of the Ahmadiyya Muslim Community. Have we missed anything? Let us know your favourite Wandsworth trivia in the comments below.